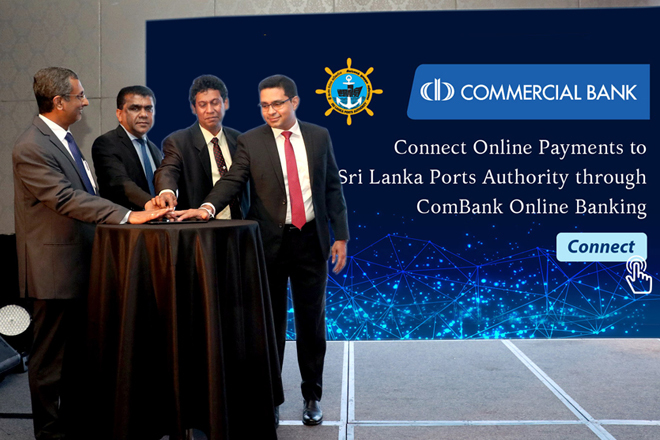 The official event marking the addition of the Sri Lanka Ports Authority (SLPA) to Commercial Bank’s Online Banking platform was recently held at the Movenpick Hotel, Colombo. Following this launch, both personal and corporate customers who have registered for the Bank’s online banking facility can pay their Ports Authority charges in respect to their shipping requirements from anywhere, 24 x 7, 365 days of the year. The launch event followed by cocktails was attended by Commercial Bank’s Chief Operating Officer, Mr Sanath Manatunge, the members of the Bank’s Corporate Management team, and Sri Lanka Ports Authority’s Additional Managing Director, Mr Upali De Zoysa, Director – Information Systems, Dr Prasanna Lokuge, Director Operations, Mr Jayantha Perera and other officials. Customers of the Bank and SLPA engaged in trading activities too were invited to the event, to raise awareness of the product and its benefits. A demonstration on how to use this facility was also part of the programme. In the picture, Commercial Bank’s Chief Operating Officer Mr Sanath Manatunge (extreme right) is joined by SLPA Additional Managing Director Mr Upali De Zoysa and Director Operations Mr Jayantha Perera (second and third from left) and the Bank’s Head of Digital Banking Pradeep Banduwansa (extreme left) at the ceremony to mark the addition of SLPA to Commercial Bank’s online payments platform.